Wow, I cannot believe how busy I’ve been with the start of school! But I guess that’s what happens at the beginning of school especially for a second year teacher…it has been a busy couple months but my second year has gotten off to a great start and I can’t wait to share some of my new ideas for the language classroom. A big thanks to creativelanguageclass.com where I stole most of my ideas. One of my goals this summer was to create/buy decor for the classroom in order to make it as much of an immersion classroom as possible. I also wanted to inspire the students with culture in the classroom. Here are some pictures of things that I added to my classroom this year. These pictures were taken Day 1 of school and now everything looks a bit different but I will post some updated photos soon. I stumbled upon this fabulous shower curtain at Bed Bath and Beyond! I had seen the idea on creativelanguageclass.com and was stoked when I happen to find it while out shopping! 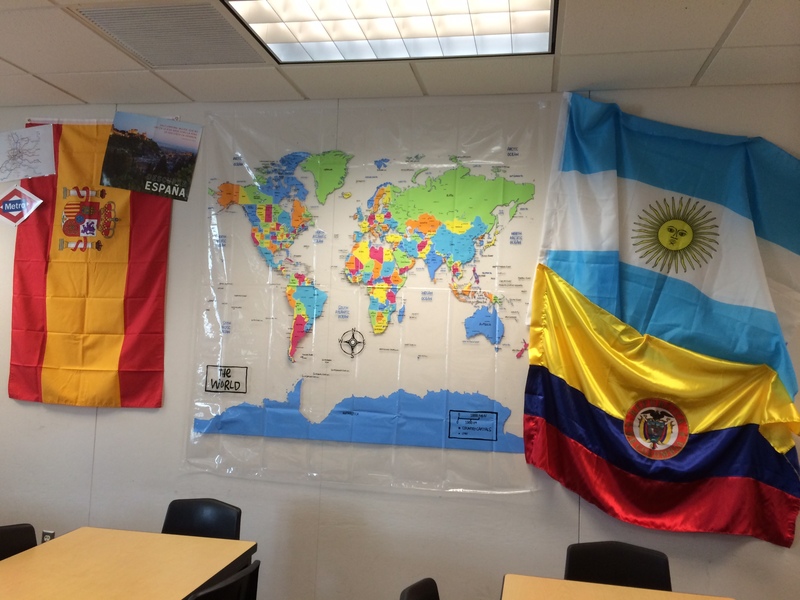 I threw up a couple flags with it that I collected this summer from my travels and now I have a back wall that I hope inspires my students to viajar! 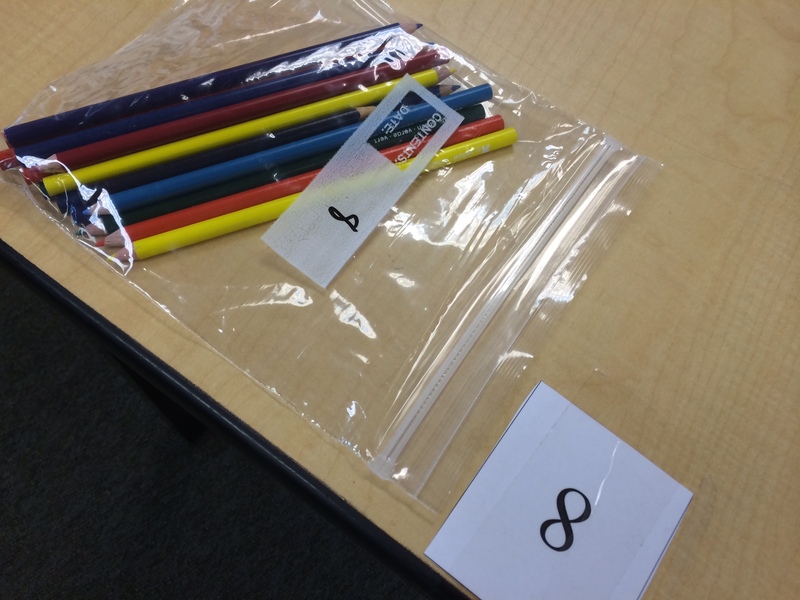 Each table was labeled with a number which has turned out to be a great way for the students to learn the numbers 1-9 as I call on different groups to share out their answers. Also I created a baggie with materials for each table, although the bags are quite destroyed now. I am still trying to come up with a better solution for how to handle materials at the tables. 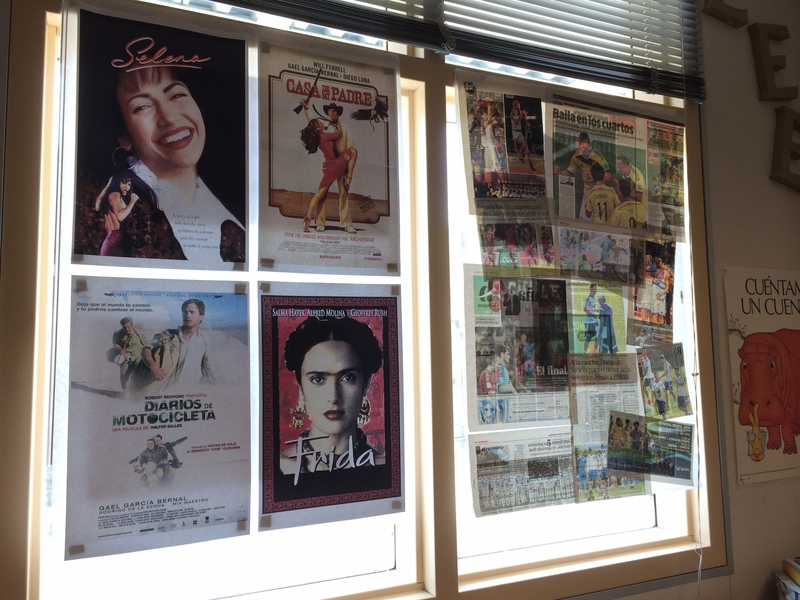 The right side window has become my ‘calendario’ area with posters that I bought at Lakeshore Learning. I also ‘inherited’ the wonderful magnetic days of the week, and seasons from my master teacher who recently retired. I created this reading nook and stocked it with picture books in Spanish that I also got from my master teacher. 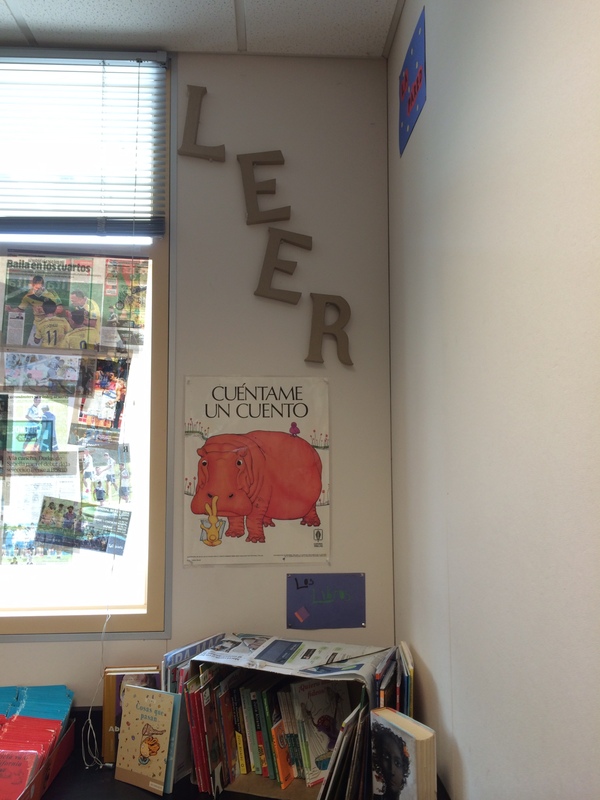 The letters for LEER I bought at a craft store…still hoping to paint them…and the cuentame un cuento sign came from another colleague. In order to set the books up, I propped them up in an old cardboard box that held reams of paper, and I covered it in newspaper from my travels to Argentina this summer. I created some collages (some are still in the making) to hang above the windows. They let light in, block out some distractions outside and display the best part of Spanish – culture! 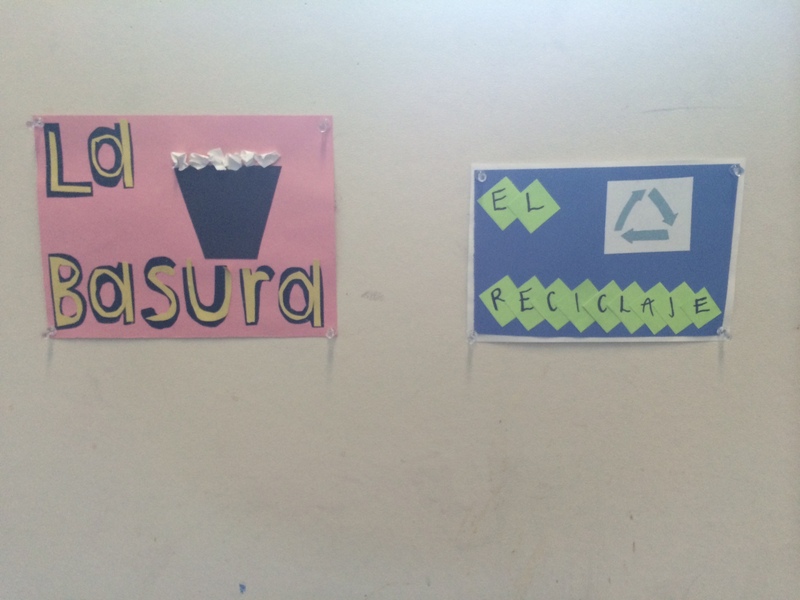 I created 4 collages to display different topics: El Cine, La Música, El Deporte y El Arte. They’ve been great to use as a reference in the classroom when we talk about different aspects of the Spanish language or culture. The best thing about the new decor in my classroom is how useful it is to incorporate into lessons. 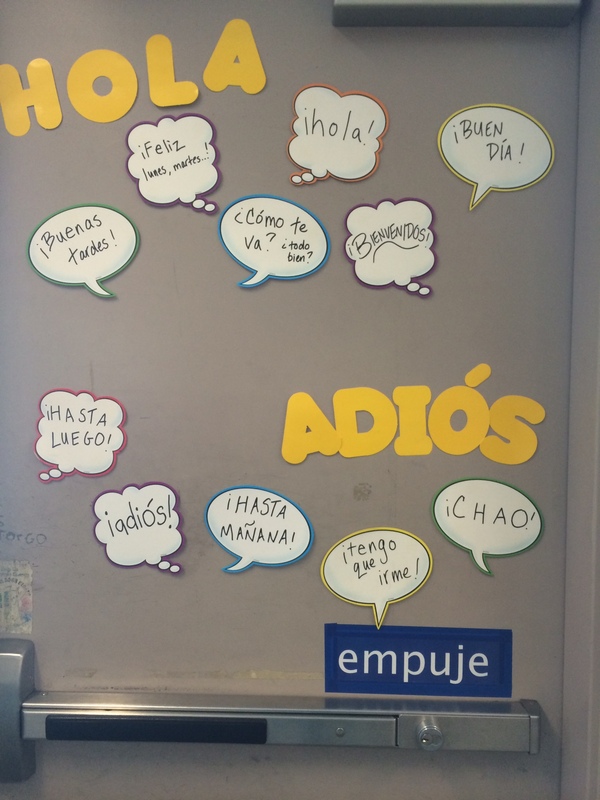 I find that I can speak more Spanish from the start (even in Spanish 1-2) by using the decor/signs as visuals for the students to learn words they’ve never even heard before. Can’t wait to add more adornos y letreros!